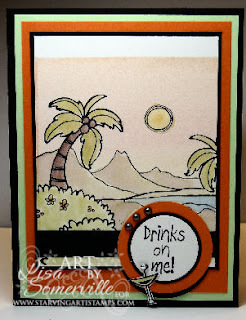 This week, Starving Artistamps is the sponsor for 2Sketches4You, be sure to stop by and enter your sketch card for a chance to win fabulous stamps from Starving Artistamps! I started off with the Spectrum Roll Technique for my background, morphing it, by adding some additional colors to my Tropical Backdrop, using my aquapainter and inks. I used my Stamp-a-ma-jig to stamp Drinks on Me. The glass was stamped in black and colored with inks and an aquapainter, I added a Rhinestone Brad on the stir stick. Don't forget you can save 10% on all Starving Artist and DoodleFactory Stamps by using code savetenls when ordering from Starving Artistamps. Darling card Lisa! Thanks for playing at 2S4Y! oh what a cute scenic card, I've never seen a card like that, very nice.